Since that time, I have learned that it is not an uncommon obsession for rose growers to go to extreme lengths to protect their flowers in preparation for entering a rose show. It is not just rose growers that will go to great lengths to protect their roses. Chrysanthemum and dahlia gardeners tend to do the same thing. If they are going to enter a flower show and rain is predicted, they will create some kind of cover to protect the flower. Knowing this, I was still unprepared to see the lengths that my neighbor Brian Williams went through this past summer to enter the long gourd category at several regional competitions. Until this time, I had never heard of a “long gourd,” but watching Brian grow them was a fascinating learning experience. In 2017, Brian took a pumpkin to a weigh-off event in Tualatin, Oregon and saw his first long gourd and knew then that he wanted to grow this gourd next year. In early 2018, Brian began preparations for growing long gourds. The long gourd, Lagenieria siceraria, is thought to have originated in Africa and is primarily grown in the United States for competitive purposes. It can grow amazingly fast in a short period of time. 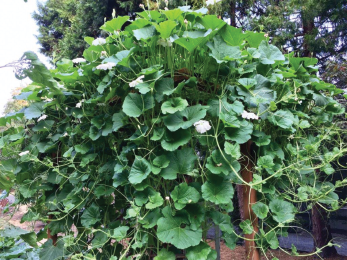 The first step for Brian was to build a structure that would be high enough and strong enough to support the long gourds. Brian built a structure that was 12 feet high, 8 feet wide and 8 feet long. Then in April, Brian planted seeds which he discovered were very difficult to germinate. Even with a heating pad he had multiple failures. Finally, he was able to get two seeds to germinate that he had wrapped in a wet paper towel and put into a plastic bag, which was kept on the heating pad. One of the seeds was from a grower in Indiana and the other from a grower in Iowa. Since Brian is from Indiana, he thought it fitting that he plant seeds from his home state. After germinating, he kept the young plants indoors for two weeks and when they were planted outdoors, each just had two true leaves. They were planted next to the trellis, which was in full sun, and the young plants protected with a cold frame. Brian had an early infestation of aphids and he sprayed them for control. Unfortunately the spray damaged the young plants. From then on, each morning, he meticulously removed each aphid with a pair of tweezers. The long gourds did not have any disease problems even though they were planted very close to pumpkins stricken with a severe case of powdery mildew. The vines grew rapidly with very strong tendrils. The first flowers developed at 12 feet and unfortunately all were male. Finally he got his first female flower, also at 12 feet. Brian had read that the flowers opened in the evening and in their native habitat were pollinated by night flying insects. Believing that there would be no such flying insects in Oregon, Brian climbed onto his 12 feet ladder at night with a flashlight and hand pollinated the female flower. A week later it shriveled. Finally in early August, more female flowers developed and his nightly ritual of pollinating the flowers was successful. It seemed as though there was always a good supply of male flowers. 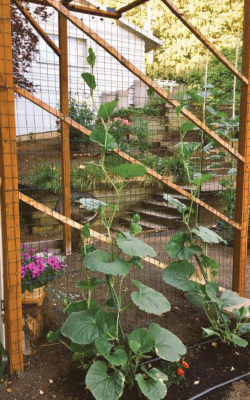 The gourds grew rapidly, sometimes 5–6 inches per day. Unsure as to the strength of the stems, he used foam padding where the stem met the trellis to lessen any stress that might occur. He does not know think that is necessary due to the strength of the stems and tendrils. 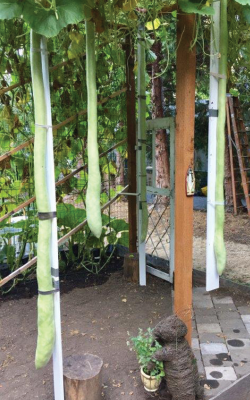 By constantly keeping notes, one of his gourds grew to 97 inches in 35 days. Brian discovered that the gourds grew very little beyond 40 days after pollination. Surprisingly the fruit is very fragile and two of the gourds, one of which was his longest, split during harvest. 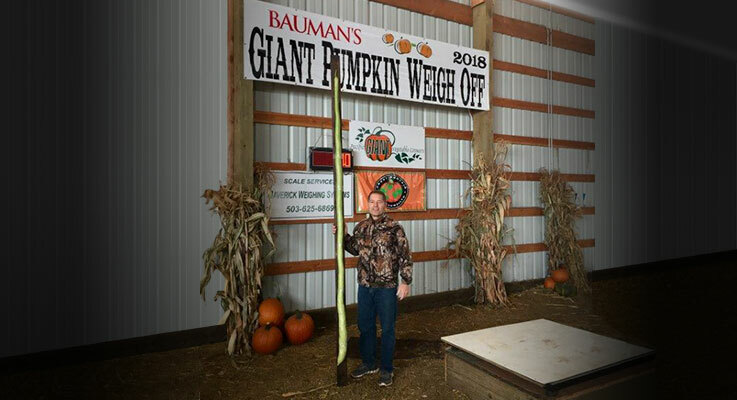 On October 6, Brian entered the Bauman’s Giant Pumpkin Weigh-Off (Bauman’s Farm & Garden, Gervais, Oregon) with a gourd that measured 105 inches. It was a personal best and won the category. The world record for long gourd growing was set in Canada in 2015 and measured 149.5 inches. In Oregon, the record is 113.75, which was set in 2006. In late August, Brian cut his vines back severely and was surprised to see that they continued to grow, bloom and set fruit. Since they have set fruit without his nighttime pollinating, they are being naturally pollinated. However, Brian said that he would still hand pollinate early in the season so he can maintain some control over the process. Brian is a member of the Pacific Giant Vegetable Growers (pgvg.org), and he would encourage other gardeners to join as members are very willing to share information and help new growers. Their stated mission is “to promote and encourage the hobby of gardening with a focus placed on the fun of competition and the production of obscenely large healthy vegetables.” Initially this group was pumpkins-only, but has broadened the categories to include such crops as corn, gourds and tomatoes. Brian told me that he absolutely loved growing these unique plants and that they were quite the conversation piece in the neighborhood and brought him a lot of gardening satisfaction. He is preparing for 2019 and, no pressure Brian, but I would expect an Oregon record! In my Digger column this past October, I asked the question; Is there such a thing as a kink-proof hose? Here are two responses.